These pumpkins look the real deal while "Halloweening," any part of your yard or house. A great decoration for halloween! Find this project and 30 more in theFREE Homemade Halloween eBook. Mark off 6 equal sections on ball of STYROFOAM. Mark center of top and bottom of ball; place 3 rubber bands around ball, crossing bands at the top and bottom, and positioning them so they form 6 equal sections. Draw lines around ball next to rubber bands. Enlarge patterns to actual size: A is 8-1/4" x 2-1/2", B is 9-1/4" x 3" and C is 10-3/4" x 4-3/4". Cut 6 pieces of batting from Patterns A and B. Center and glue batting piece A to each section of the ball. Center and glue batting piece B on top of smaller pieces, staying within section lines. Cut 6 pieces of fabric from Pattern C.
Beginning with one section and working around the pumpkin, center a fabric piece over scored lines. Position knife on lines and push seam allowances into foam. For a clean, crisp "seam," hold knife straight up and down. Push excess fabric into the holes at top and bottom of the ball; carefully trim excess fabric. Cut a 1-1/2" x 10" strip of corrugated paper. Roll tightly to create stem, gluing end to hold. Cover one end in glue and push into top of pumpkin. Cut leaves from remaining paper. Coat one tip of leaf in glue and push into top of pumpkin beside stem. Wind florist wire around pencil to make tendrils and glue into hole next to stem. 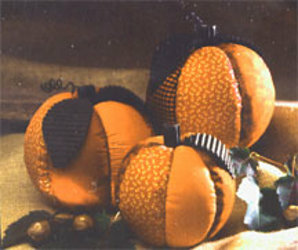 Check out other easy Halloween crafts!